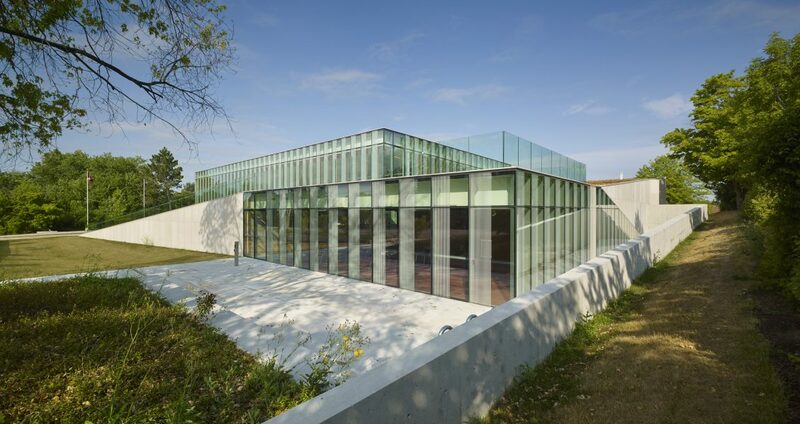 As RDHA design partner Tyler Sharp explains, a few years after Waterdown, Ont. 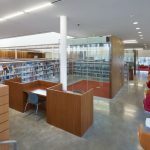 was amalgamated into the swelling city of Hamilton, its small local library was no longer adequate for the expanded range of services the community required. 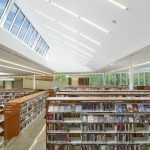 The new design had to incorporate a range of diverse facilities — from police and municipal community services to a heritage society archive and a seniors’ recreation centre, along with a new, bigger library — into a relatively modest 23,500-sq.-ft. building, and for an equally modest $6.8 million budget. What makes the building engaging is how the architects worked with these “givens,” and came up with a design that is, in a sense, an architectural portrait of its surroundings. 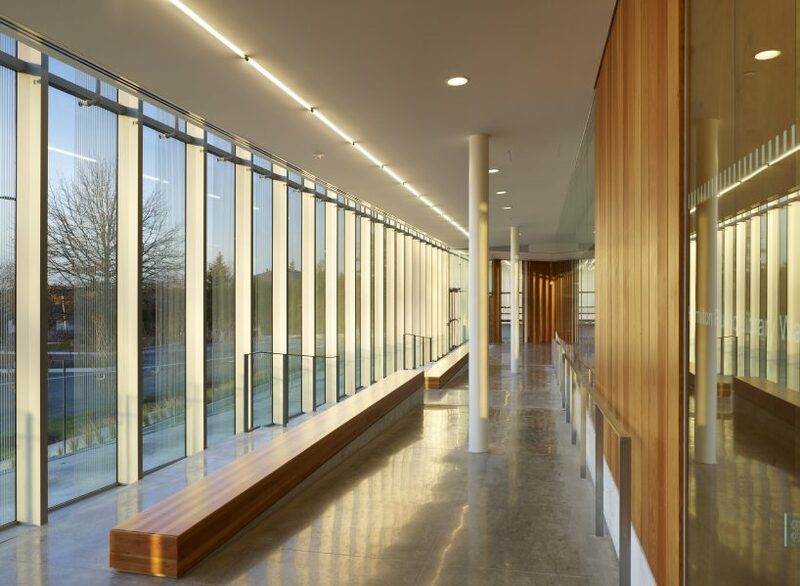 The gentle grade of the site is accommodated by interior pathways that wind through the length of the buildings. 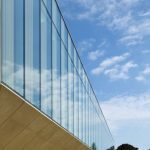 Waterdown lies on the edge of the Niagara Escarpment, an ancient core of deep bedrock covering much of west and central Ontario characterized by exposed granite, limestone cliffs and wild, rugged terrain. 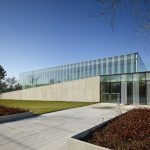 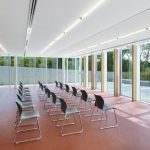 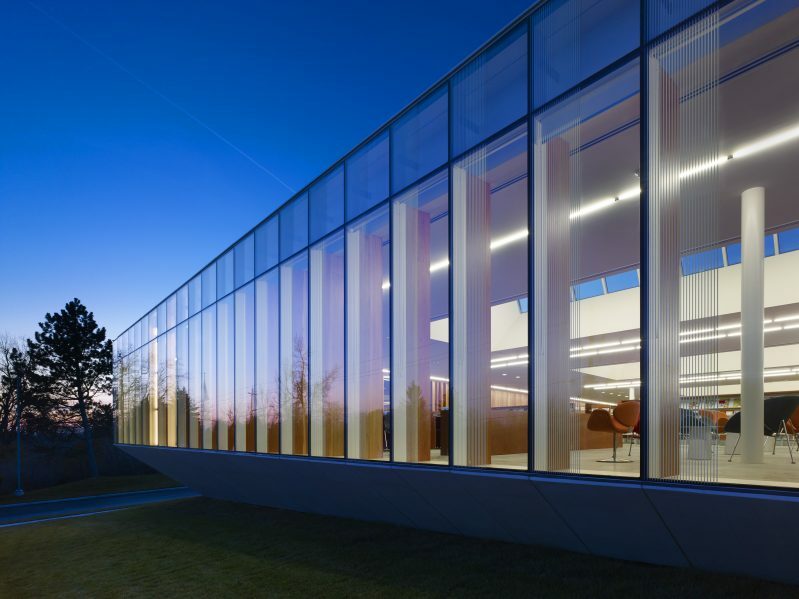 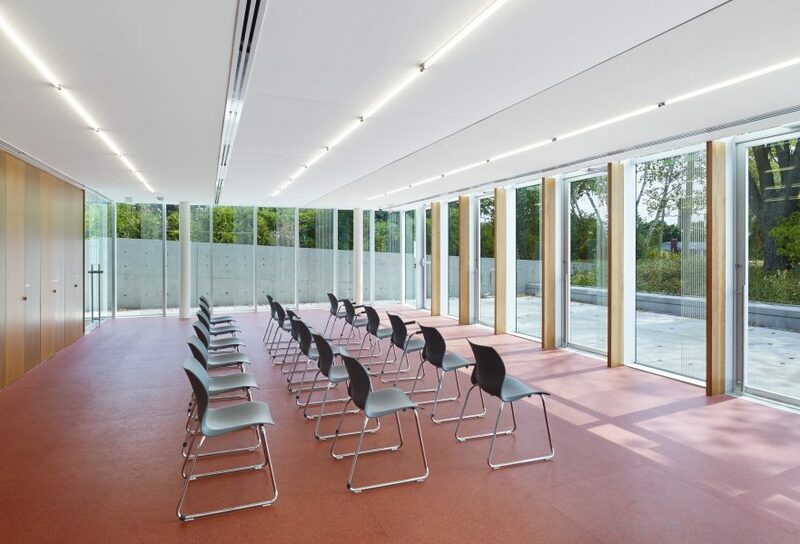 The building stands on a high point on the Escarpment, where the lay of the land drops a full 12 feet from the rear parking lot to the front entrance, and continues in a steep descent all the way to Lake Ontario, about five kilometres to the south. 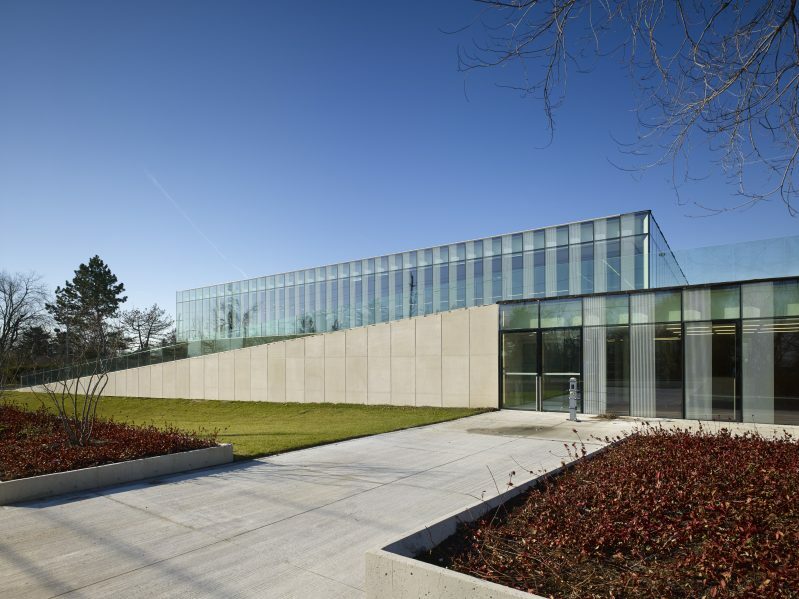 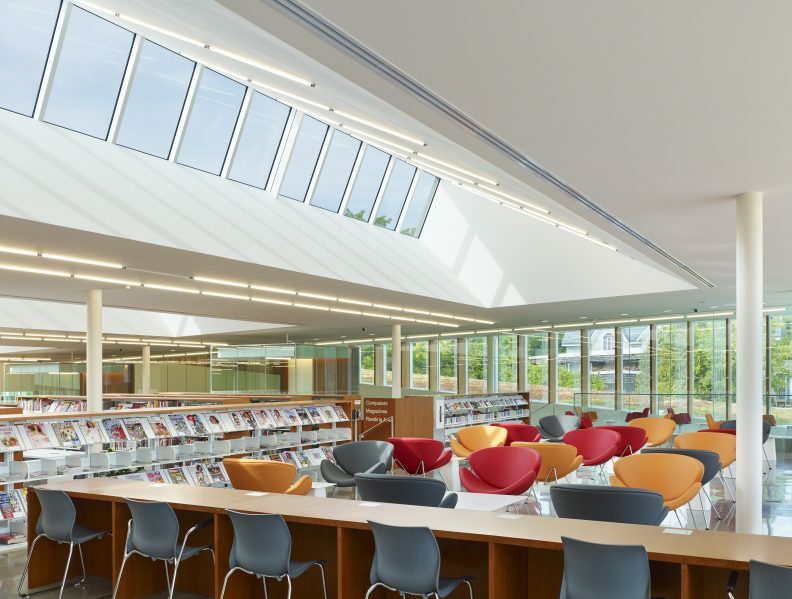 Inside and out, the internal topography of the building relates to the natural one, descending in terraces or steppes from the library stacks at the summit, down through a series of centres to the seniors’ recreation area at the foot. 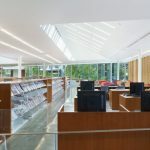 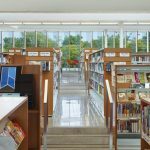 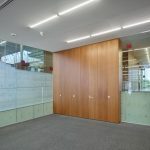 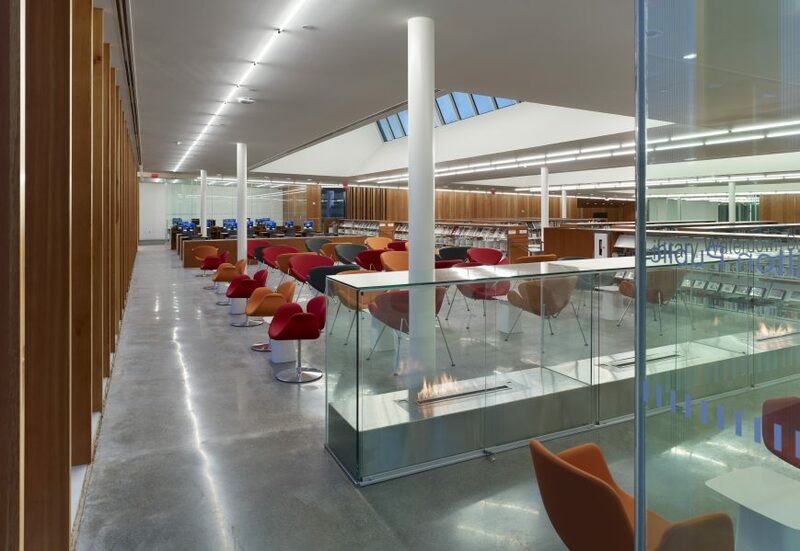 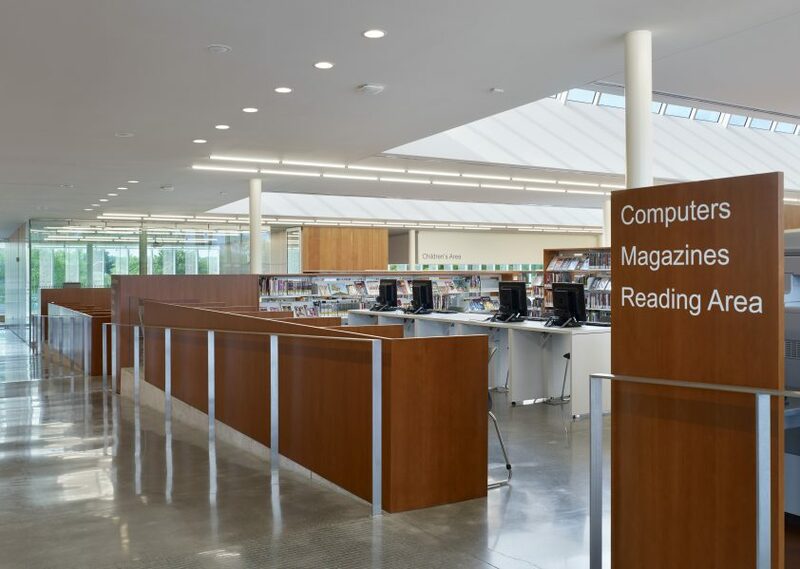 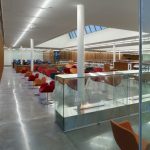 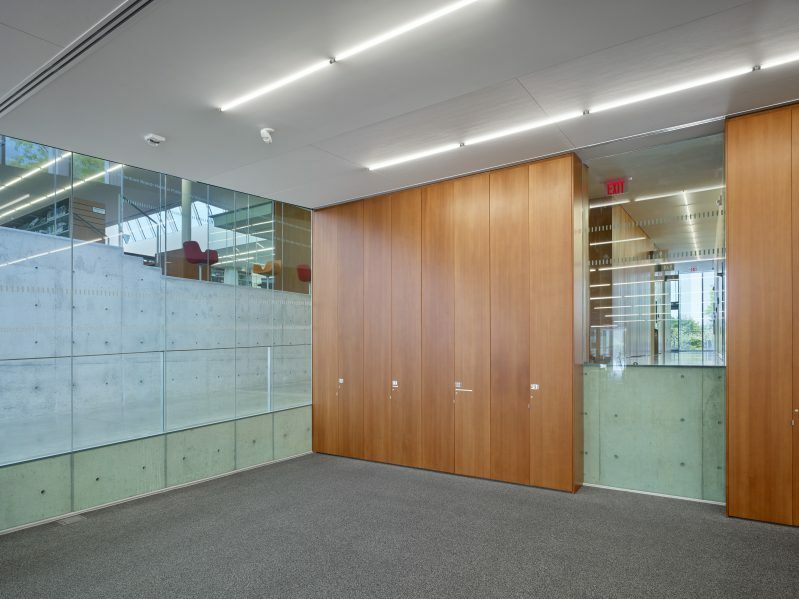 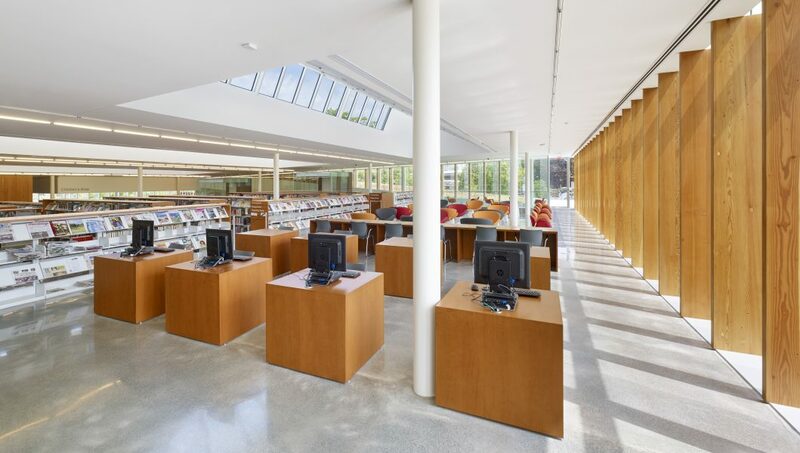 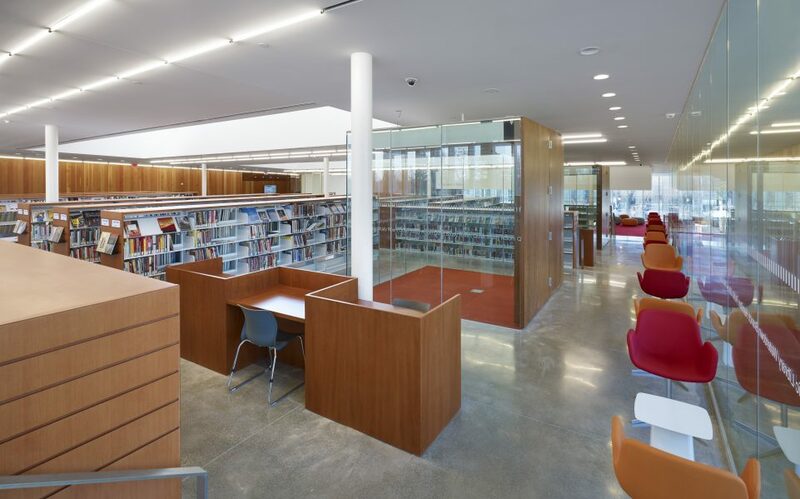 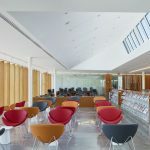 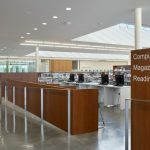 Some of the angles and grade changes — such as long, sloped walkways and steps that trace the gentle rise in the floor of the library section — are purely practical. 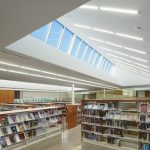 But there are also high, slanted ceilings punctuated by skylights and clerestory windows, a sun-filled atrium, angled shade fins along one long side, and clearly visible from inside, concrete exterior retaining walls that follow the slope. 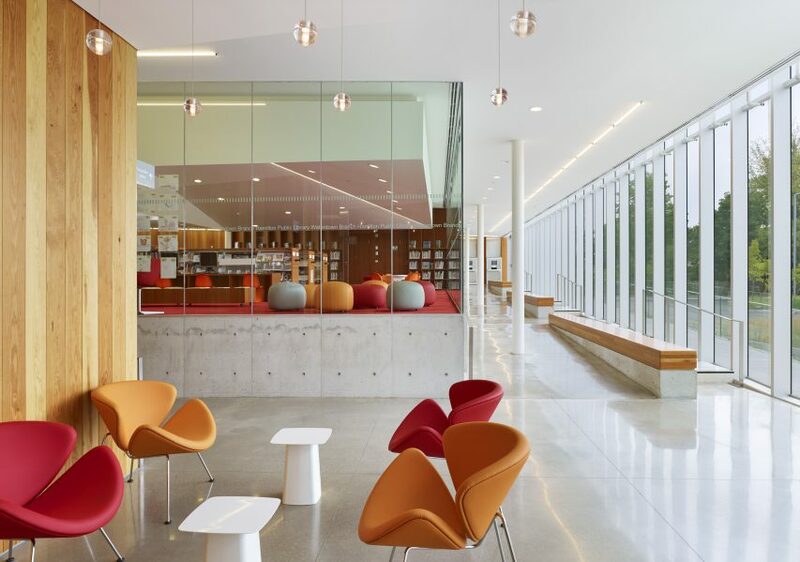 Douglas fir panelling, reclaimed by serendipity from the former library, and bright Paulin Orange Slice and Tulip chairs add a note of vibrant life under angled sunlight from clerestory windows in the reading area. 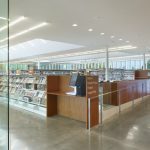 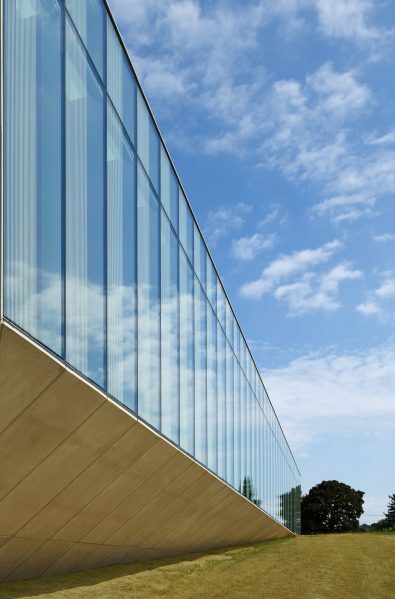 Despite the use of massive-looking materials like poured concrete, there is a pleasing lightness to the interior, with slim white retaining columns, polished concrete floors and an abundance of natural light pouring in through load-bearing laminated glass walls. 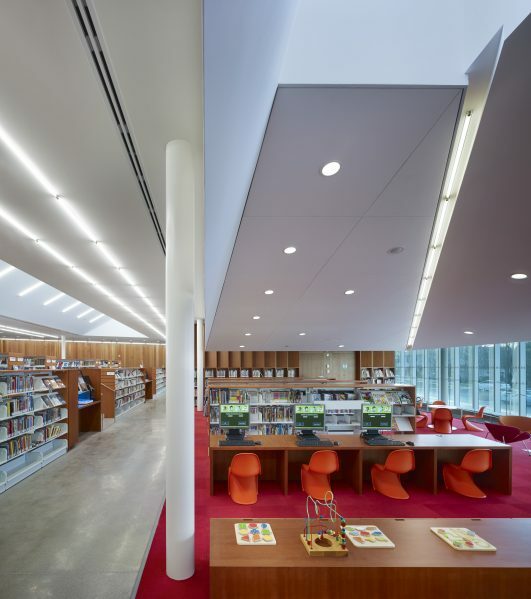 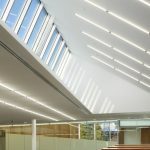 Variations in ceiling heights play with scale and help to subtly define centres without the need for much enclosure: high and bright in general areas and the atrium at the top end, low and intimate in the children’s section. 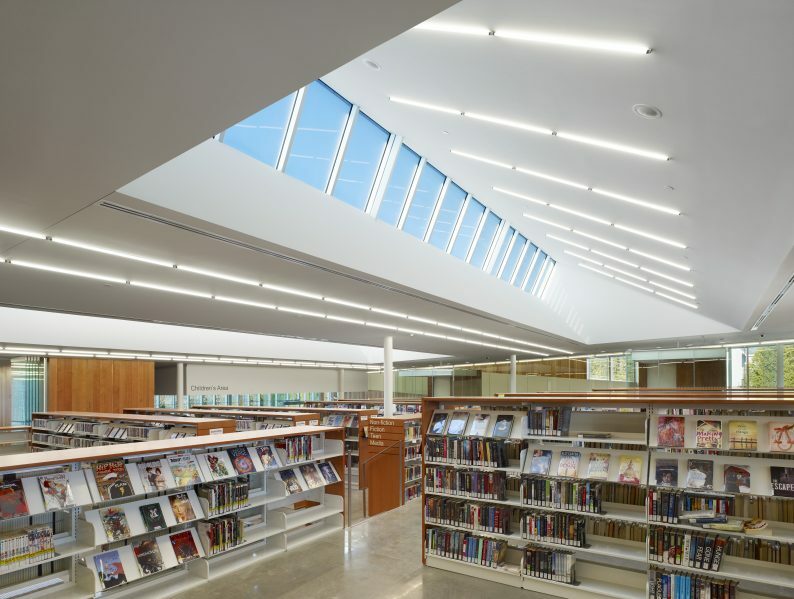 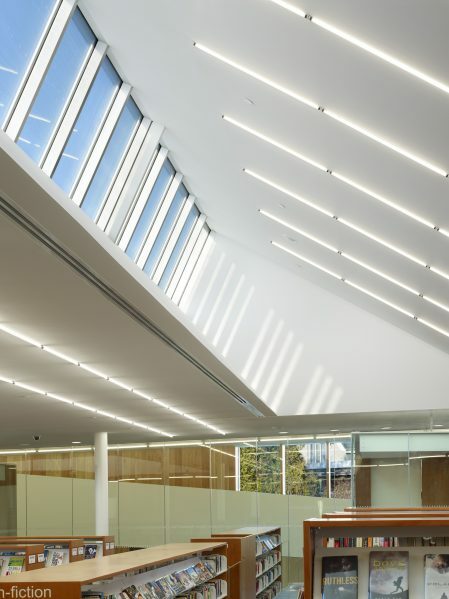 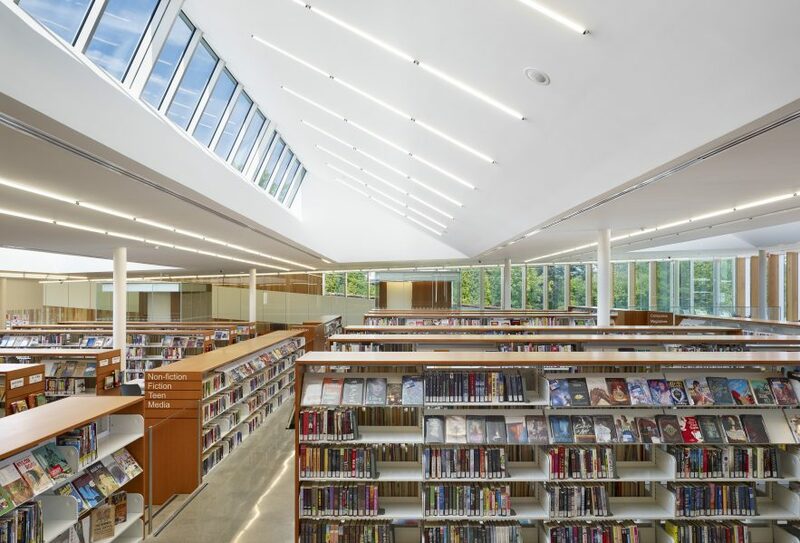 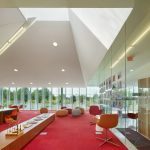 Sweeping, angled planes in the ceilings are a kind of metaphor for the steep cliffs and valleys of the landscape, visible all around through expansive glass walls that encircle the library. 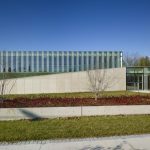 Sustainable landscape features include a parking lot shaded by flowering trees, bioswales that are part of a rainwater catchment system, and a green roof planted with hardy local species. 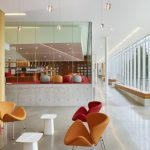 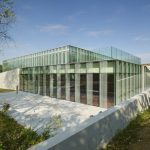 spite its size, there’s a surprisingly lightness, even delicacy, to the interior, with slim white support columns, structural glass wall panels and simple materials like polished concrete floors.